Nimon2 is located in the temple district of Kyoto adjacent to Kyoto’s Higashiyama tourist area. * The area around the house has many interesting shops and is steeped in Kyoto history. The highlights of Kyoto; Heian Jinju, Kyoto Museum, Nanzenji, Kodaiji and Chion-in Temples, Maruyama Park, Philosophers Path and many more are an easy stroll from Nimon2. *Please be advised that Nimon2 is located directly behind a Japanese temple, which also has a graveyard that is visible from the windows. The property has 1 cozy bedroom and a modern dining area/compact kitchen! 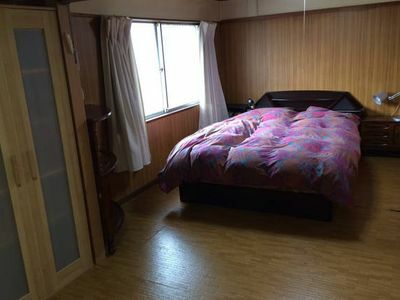 The house is divided into two floors: has 1 designer bedroom with 4 single western mattress beddings. (2 single beds can be pulled out from below the beddings seen in the pictures) Separate spacious bathtub/shower room and toilet on the second floor; bedroom on the third floor. 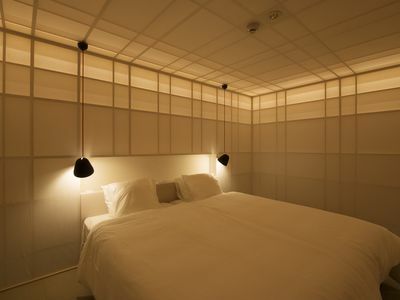 Enjoy a truly unique Japanese style bedroom with adjustable lamps to create a relaxing atmosphere after a full day outside. Perfect location for sightseeing and for your night life too. 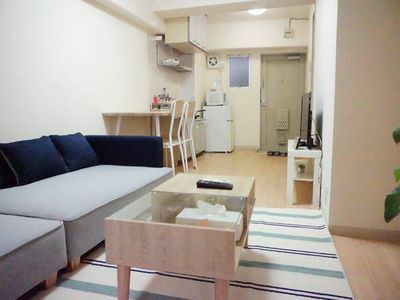 Easy walking from Sanjo station (6-7min walk) and Higashiyama Station (6-7min) located in central Kyoto. Kitchen, Restroom, and bedroom is very beautiful equipped with modern kitchen amenities. The house has: =FREE unlimited data in-House Wi-Fi =Fridge =Basic Kitchenware and tools = Hair-dryer = Shampoo, conditioner, and body-wash = and of course, lovely, soft towels! 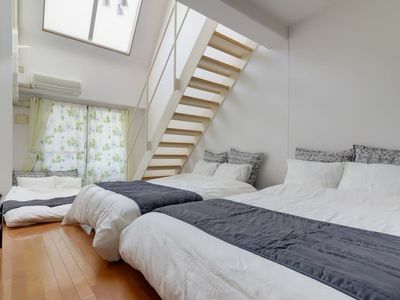 Nimon1 is located in Sakyo Ward, which is positioned between the historic districts of Kyoto and the downtown area, so it is ideal for both sightseeing and for enjoying Kyoto's nightlife. Despite its proximity to both, the neighborhood is quiet and peaceful, so you can have a good rest after a long day of exploring. There are many interesting cafes, antique shops and specialty shops that make sweets, incense and bags from old kimonos. Fifteen minutes away are the Higashiyama mountains that have superb hiking. Also the upmarket restaurant area of Pontocho along the banks of the Kamogawa River is an easy stroll. This whole area is flat and an easy walk and as with all Kyoto is quiet and perfectly safe. 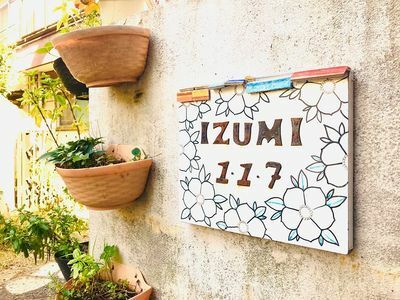 The house is about a 7 minute walk from Sanjo Station, where guests can use the subway to get around the city or the Keihan Line to Osaka. ===== TRANSPORT ===== Closest train stations... Easy walking from Sanjo Keihan station, Sanjo subway station, and Higashiyama Station (6-7 min walk). Easily access wherever you want!! It is easy for accessing to the main train lines heading out of the city to the various other stops on your itinerary. Osaka, Nara, Kobe, Wakayama, Hiroshima, Tokyo... There are the hub of bus services in Kyoto. The services will take you almost any famous landmarks, temples and shrines. In 3 mins walk : Convenience Store Grocery Store Supermarket, Drug Store, Of course tons of restaurants and bars since it's close to Kyoto main area! !